A moderate snow event will impact the Finger Lakes today. Unfortunately, the heaviest snow will coincide with the evening commute. Use caution and give yourself extra time to get home. 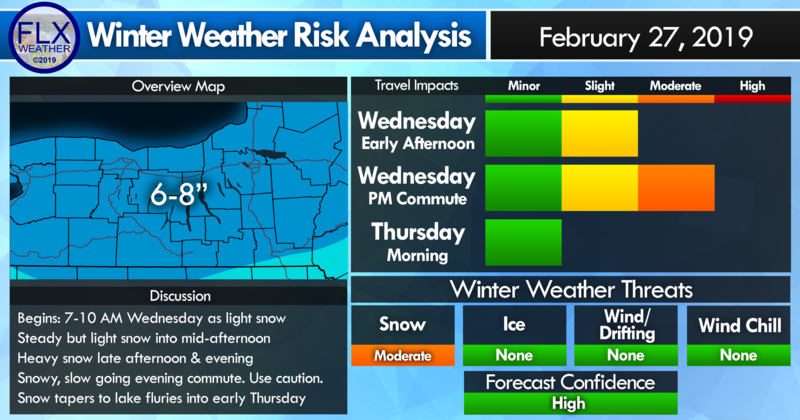 A small but potent storm system will take a perfect track for a moderate snow event across the Finger Lakes on Wednesday. Snow will slowly spread northeast across the Finger Lakes this morning. Only light snow is expected through the morning and early afternoon hours. The snow will begin to pick up in intensity after 4 pm with snowfall rates of one-half to one inch per hour through the evening commute. This will lead to snow covered roads and tricky travel conditions. Even main roads will likely become rather messy. Allow yourself extra time to get home this evening, use your headlights, and slow down. The heavy snow will continue into the evening hours before tapering to flurries by midnight. Widespread snow amounts of 6-8 inches are expected on Wednesday with the heaviest coming during the late afternoon and evening. Click to enlarge. 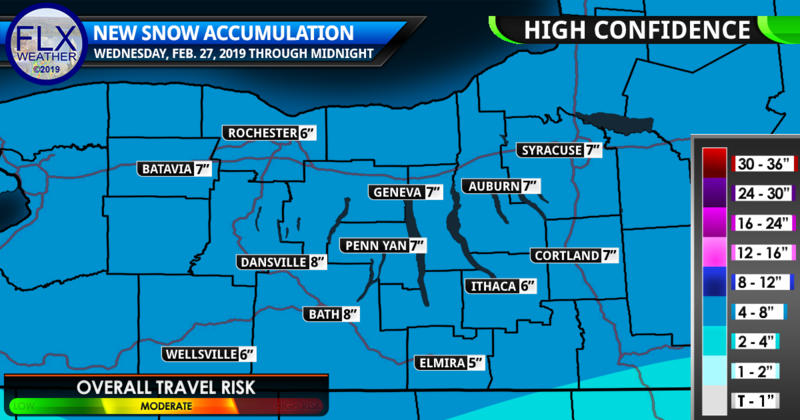 Total snow accumulations will be between 6-8 inches for all the Finger Lakes. The eastern portions of the Southern Tier south into northern Pennsylvania will see a drop off in snow amounts. Winds will be gentle with this system with top gusts around 20 mph throughout the snow. Additional hazards from blowing and drifting are not expected. Ice is not expected either with the atmosphere plenty cold for all snow. The snow that falls will likely be on the light and fluffy side. Temperatures will spend the afternoon around 20 degrees but will rise into the mid 20s overnight as the low passes through. All in all, this is a moderate snow event that requires some caution, but it is not in any way abnormal for February in the Finger Lakes. Lake effect snow showers will develop behind the system for the remainder of the night and into Thursday morning and the early afternoon before winds begin to shift. Additional accumulation from lake effect should be an inch or less, but a few roads may still be slick as a result Thursday morning. Some sun will be possible later Thursday and into Friday. Temperatures Thursday will be in the low 20s, but south winds Friday will push temperatures into the upper 30s and low 40s. A weak system will pass through on Saturday. Rain and snow may mix initially, but precipitation should end as light snow. Some minor accumulations may be possible. Sunday will start quiet, but another system will approach late in the day. This system looks more potent, but its track is still highly uncertain. The chances for a significant snowfall are about the same as a complete miss. Watch for premature weather hype regarding this system. Temperatures this weekend will depend on these two systems but should be into the 30s on Saturday and somewhere between 25-35 degrees on Sunday. A shot of cold air looks likely next week with highs stuck in the teens Tuesday and Wednesday. Can you help secure the future of FLX Weather with a donation of just $5 per month? Your contributions are needed to keep Finger Lakes Weather running and growing. Donating is easy, safe, and secure through either PayPal or Stripe. Once you set your monthly donation up by filling in the form, the system will take care of the rest. All you need to do is keep enjoying Finger Lakes Weather!